Romance scammer could con you into illegal acts. INDIANAPOLIS — Love is in the air with Valentine’s Day quickly approaching, but the Better Business Bureau and the Attorney General’s office are both warning consumers not to let romance cloud their judgment. 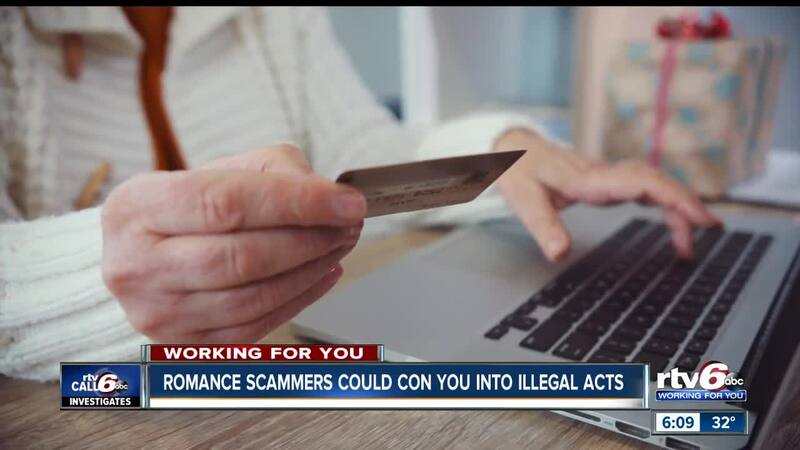 The BBB and Attorney General issued warnings on Wednesday about romance scams, which can leave you broke, alone and possibly in jail. One victim, who RTV6 will call 'Kelly,' went on a popular dating website to find a special someone. Kelly says her boyfriend built up a trust with her. “He told me how much he loved me, and that I was his soulmate,” Kelly said. Kelly’s lover asked her for a favor that would help him with his new business. "He would have a friend send money in my name for me to pick up and then he would ask me to buy him some Amazon cards and then send him the receipt and the cards," Kelly said. What Kelly later learned is that she was not only the victim of a romance scam, the scammer had turned her into a money mule. Fraudsters use money mules to transfer cash and cover their tracks to avoid law enforcement detection. “People who fall for these romance scams do money laundering, stolen goods, even carry drugs for these people,” Tim Maniscalo, president of the Better Business Bureau Serving central Indiana, said. Consumers have lost nearly $1 billion to romance fraud over the past three years, and it’s one of the BBB’s 10 riskiest frauds. "It's more than about the money,” Maniscalo said. “You could actually be doing something illegal for these people." The scammers will typically spend weeks or even months making their victim feel loved and appreciated. The Attorney General’s office also issued a warning to consumers Wednesday about romance scams. "What we're getting are the complaints where the individual says I thought this person and I were in a relationship, they had an emergency and I sent them money, now they've disappeared, and I can't find them anymore,” Betsy DeNardi, director of consumer protection for the Indiana Attorney General’s office, said. Most romance scams originate, so it’s nearly impossible for the BBB and the Attorney General’s office to get justice for victims. “Often times, the person isn't even in the United States even though they said they live one town over from you,” DeNardi said. If you’ve been scammed, you can file a report at www.indianaconsumer.com or file a report with the BBB Scam Tracker at https://www.bbb.org/scamtracker/us.